Our vision is to be a one stop provider for all SME MRO needs. SMESHOPS will empower SMEs to utilize our technology and operational excellence in selling and procuring goods online. We seek to become the host of largest and most reliable collection of Industrial products for businesses, offices and manufacturing units in India. 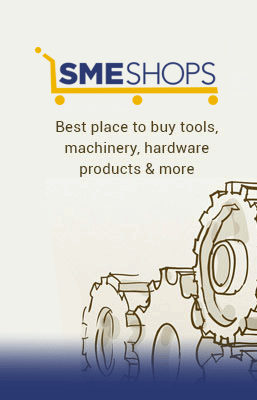 Power2SME is the first 'Buying Club' for Indian SMEs that aims to empower and propel them on the fast lane to growth. Headquartered in Gurgaon, Power2SME has 5 more offices spread across Mumbai, Chennai, Kolkata, Ahmedabad and Pune. Having started its operations in 2012, Power2SME with its mission 'Empower SMEs to enable the India growth story' has a proven track record of enabling small businesses and enterprises enhance their overall productivity and achieve measurable business value through its offerings. We play a crucial role in sourcing input raw materials for SMEs at the most economical price points in varied categories like Chemicals, Inks, Paints, Metals, Polymers and more. This helps SMEs focus on their core business of accelerating growth, both in terms of revenue and development. Armed with a collaborative workforce, the team at Power2SME comprises professionals who are driven by a passion to help empower the SMEs in order to achieve their goals. What makes us unique is our ability to make customer engagement a delightful experience. The team comprises over 120 professionals with domain expertise in sales, supply chain, marketing, finance, human resources and IT. Awards and accolades have been an important part of our organization's success story. Our company has bagged several recognitions. It was selected amongst the Red Herring's Top 100 Global list for the year 2013. It was also chosen amongst the Red Herring's Top 100 Asia list for the year 2013. Our CEO and Founder Mr R Narayan won the 'Serial Entrepreneur of the Year' award at the Entrepreneur India Awards 2013. Our investors share our conviction in the pool of opportunities that exist in growth markets and our wish to help and build sustainable and vibrant SMEs across the country. Our company has raised 4 rounds of funding from Inventus Capital, Kalaari Capital, Accel Partners & Mr. Nandan Nilekani. We are focused on working with large, established and trusted suppliers so our customers are assured of the quality of the product that they buy from us. Our current suppliers include companies like SAIL, IOCL, GAIL, AkzoNobel, Haldia, etc.